North Cyprus is an amazing country and the ideal place for your Mediterranean summer holiday.Whilst the country itself may be small, Northern Cyprus really is packed with amazing things to do and see. So, don't just sit by the pool in the glorious sunshine, rent a North Cyprus hire car and get out there and explore! With car hire in North Cyprus (from Pacific Car Hire, of course!) you can discover rugged mountains, luxurious sandy beaches, fantastic ancient sites and ruins, all set in some of the most beautiful unspoiled countryside imaginable. Northern Cyprus really is the perfect summer holiday location, just ready for you to explore in your Pacific Rent A Car! If you're looking for almost endless sun on your summer holiday, North Cyprus certainly will not let you down. North Cyprus enjoys over 300 days of beautiful Mediterranean sunshine each year, so even in the winter many days are clear and sunny, with azure blue skies. Combine this with beautiful scenery, friendly locals, excellent food, and great prices on North Cyprus car hire from Pacific Rentals, you really will see why so many people are changing from the expensive Euro zone of south Cyprus and coming to North Cyprus for great value holidays. At Pacific Rent a Car, for example, our prices can be as much as a third lower for a week's car rental in North Cyprus than the equivalent hire car costs in south Cyprus. North Cyprus is a great place to relax, with warm sunny days and cooling summer breezes, plus that unmistakable smell of the Mediterranean - with a Turkish twist!If you are holidaying from Britain or Ireland you will definitely feel at home in any North Cyprus hire car,as driving is on the left hand side of the road, just like at home.All the road signs are the same too, which makes things so much easier when navigating your way in your North Cyprus hire car. We make North Cyprus car hire so easy. We'll meet you at Ercan airport with the keys to your North Cyprus rental car, or deliver it to any location in North Cyprus for free. We have a wide range of Northern Cyprus rental cars for you to choose from, from economy and compact cars to rent by the day or by the week,to 4x4 jeeps for a day or two of fun! For families, our quality car rental fleet includes the 7-seater Opel Zafira, ideal for day trips to any one of the 70+ beaches in North Cyprus, golfing holidays, and much more thanks to its large boot capacity.If you really want to enjoy North Cyprus, car hire is an absolute must. Having a holiday in North Cyprus is something that you will remember forever. This ancient country is filled with fascinating history, and no matter where you stay, the past surrounds you. Combine this historical landscape with plenty of new North Cyprus hotels built with comfort in mind, and whether its relaxing by the pool, dining in fine restaurants, or enjoying a drink at the bar, there is a Northern Cyprus hotel for everyone. Remember, Pacific North Cyprus car rental service includes delivery to any North Cyprus hotel or resort. 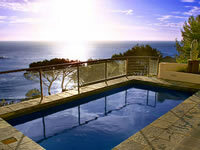 North Cyprus also has a good selection of modern holiday villas and apartments for rent. Many villas and apartments make the most of the glorious scenery and fantastic coastal views, and with a hire car in North Cyprus, you have the freedom to do what you like with your villa as a base, from shopping for essential supplies, to driving to a superb restaurant. Turkish Cypriots are extremely proud of their heritage and love to tell their stories. Many also speak excellent English so be sure to take advantage of this, although you shouldn't need to ask directions from your North Cyprus hire car thank to the map provided by us! 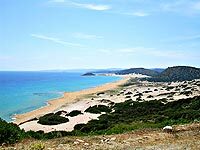 North Cyprus has some of the best beaches you will ever find, and there are over 70 of them to explore in your North Cyprus rental car. These beautiful sandy beaches stretch for miles, and out of season, chances are you'll have them all to yourself too! When you holiday in North Cyprus you will be amazed at how much there is to do.You can spend the day at the beach, jump in your TRNC hire car and explore the mountains and forests, explore the ruins of ancient monasteries, and so much more. You can also take time to explore the ancient temples, where offerings were made to the different gods by the Greeks and the Romans.In fact this country is filled with so much to do and see that you may find it hard to pack it all in. The food in North Cyprus is a mixture of familiar Mediterranean delights and recipes from the Byzantines. Traditional Northern Cyprus dishes include fresh fish caught straight from the Mediterranean Sea, simply grilled and served with freshly picked vegetables. Meze is also very popular, a selection of up to 20 different dishes that will definitely delight your taste buds! Most restaurants in North Cyprus has private parking places which are free of charge, so you do not have to worry about finding parking for your North Cyprus rental car. Turkish Cypriot restaurants will serve tasty, traditional dishes such as 'borek', which are hot pastries that can be filled with meat, cheese, or spinach.You can also enjoy the taste of Turkey with a strong Turkish coffee and a slice of sticky baklava pastry, sitting beside the harbour in Kyrenia,another good reason to hire a car in North Cyprus if you are not staying in the town itself!Turkish delight is a popular souvenir, so don't forget to bring some of this home with you too. You don't have to stay by the pool when you holiday in North Cyprus and in fact there are a large number of activities that you can partake in. Hop in your North Cyprus rental car and pop down to the major beaches to try the water sports on offer. Or explore the depths with Northern Cyprus diving schools, gliding over the wrecks of ships and perhaps encountering a rare green sea turtle! For golf enthusiasts there are a number of excellent golf courses in North Cyprus, so don't forget to hire a car that has a large boot to carry your golf clubs.The Korineum Golf Course is one of the best, so be sure to check in to this international standard club on your golfing holiday in Northern Cyprus. If you fancy more of an adrenalin rush, you can try paragliding from the mountains right down to the coast or take the family in the hire car for a fun-filled day at the go-kart track.Whatever you fancy, North Cyprus has something for everyone. With so much to see and do, isn’t it time you booked your car hire in North Cyprus with the local experts, Pacific Rent a Car? Book online and you'll save 15% too!